See more objects with the tag architecture, advertising, display, exhibition, modernism, typography. See more objects with the color tan darkslategrey lightslategrey grey dimgrey or see all the colors for this object. This is a Poster. It was designed by Edward McKnight Kauffer and made for (as the client) MARS Group. It is dated 1937 and we acquired it in 1963. Its medium is lithograph on tan wove paper. It is a part of the Drawings, Prints, and Graphic Design department. 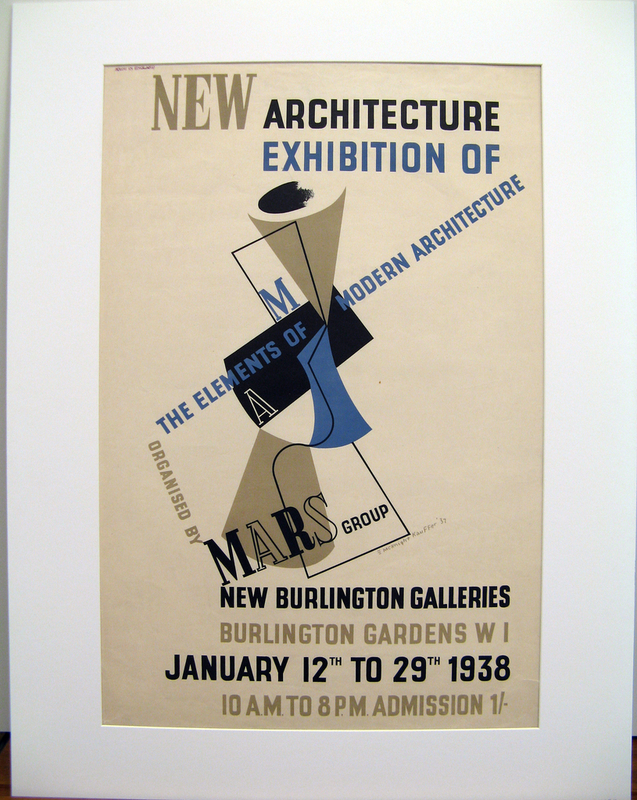 This poster publicized an important exhibition by the MARS (Modern Architectural Research) Group (1933–57) that promoted modern architecture in Britain as a solution to social needs. The exhibition was intended to allow the public to view modern architecture and understand its role in contemporary life. It is no surprise that the group commissioned E. McKnight Kauffer, then London's top modern graphic artist, to design the exhibition poster, shown here, and catalog cover. Kauffer had helped revolutionize poster design in Britain, applying fine-art sensibilities and styles, such as Cubism and abstraction, to the commercial arts. He believed art and commerce, though distinct, could exist harmoniously. Kauffer closely analyzed how people viewed posters, recognizing the importance of color and determining that geometric design attracted attention. 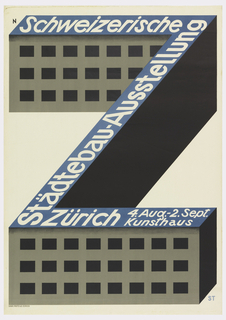 The simplified form and colors of this poster were in line with British modernist styles at the time. The exhibition, open for less than three weeks, attracted 7,000 visitors, gaining attention and support for modern architecture in Britain.